The Golden Sun Moth Synemon plana is a small diurnal moth belonging to the family Castniidae in the insect order Lepidoptera. The Castniidae includes 30 genera. The Australian species are represented by a single endemic genus Synemon which contains about 43 species. The adults of all the species are generally dull-coloured; females have brighter hind wings. The Golden Sun Moth is found in south-eastern Australia and confined to grassland habitat, including native grasslands, grassy woodlands and grasslands which sometimes comprise a combination of exotic and native grasses. All known records of Golden Sun Moth in Victoria. Source: VBA 2015. Note: this is not intended to be a full list of all sites where Golden Sun Moth could be found. Ararat Rural City - some sensitive sites located within this local government area. Gannawarra Shire - the shire contains areas of native grasslands in private ownership. Hindmarsh Shire - areas in and around the township of Nhill monitored by Trust For Nature and Field Naturalists, Salisbury Bushland Reserve. Hume City -Amberfield Conservation Reserve, Cooper Street Grassland Reserve managed by Parks Victoria and monitored by the Merri Creek Management Committee. Mitchell Shire - Mt Piper area (Parks Victoria) monitoring by Friends of Mt. Piper BEAM and adjoining landholders. Murrindindi Shire - Gobur district, Flowerdale, Taggerty, Yarck, Wandong, Kilmore, Glenaroua and near Yea private areas of native grasslands. Southern Grampians Shire - areas of private property containing native grasslands, Hamilton Community Parklands and Wannon Township area. Wangaratta Rural City - Carboor & Tuan Ridge areas of private land with native grasslands. Whittlesea City - Craigieburn Grasslands Flora and Fauna Reserve (Parks Victoria). Wyndham City - Derrimut Grassland Nature Conservation Reserve (Parks Victoria) monitored in conjunction with the Victorian National Parks Association. at Salisbury Bushland Reserve in the Wimmera. 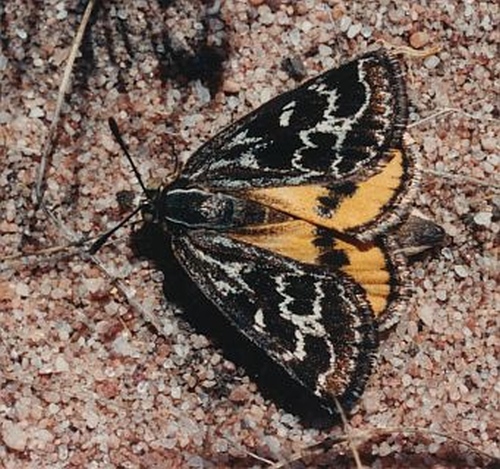 The Golden Sun Moth occurs in native grasslands dominated by species from the genus Rytidosperma (formerly Austrodanthonia) Wallaby Grass, in particular Rytidosperma carphoides, R. auriculata, R. eriantha, and R. setacea. These plants are found on a range of soil types in a variety of environmental conditions. Until recently it was generally considered that the Golden Sun Moth would only be found in situations where native grasses were most dominant. e.g. Dear 1997 found the percentage cover of Rytidosperma (Austrodanthonia) must be greater than 40% to be suitable for the Golden Sun Moth. However, studies by Richter et al. 2013 found that mature and immature life stages of the Golden Sun Moth can exist in grasslands comprised entirely of the exotic Chilean Needlegrass (Nassella neesiana). managing existing areas of native grassland through biomass reduction i.e. managed burning. restoring degraded native grasslands through removal of weeds and planting Rytidosperma seedlings to achieve a 40% cover (O'Dwyer & Attiwill 2000). The female Golden Sun Moth lays eggs in the base of the host plant and once hatched the larva are thought to feed on the roots of a host plant for up to two years. After pupation the adult Sun Moth emerges, it has no functional mouth parts and does not feed. It has a flight period of only a few days and is found to be most active on sunny, still, warm-hot days (mostly mid November to mid December). After mating the female lays eggs and the adult moths die. The Golden Sun Moth has a very specialised habitat of grasslands dominated by Rytidosperma spp. These grasslands have been almost entirely destroyed, or significantly altered, by agriculture. Despite recent research indicating Golden Sun Moths may occupy some weedy grasses (Richter et al. 2013), it is important to limit the incremental loss of their natural habitat comprising remnant native grasslands. Populations of Golden Sun Moth have been isolated and fragmented, impeding the ability of the relatively immobile females to recolonise areas, thereby reducing the likelihood of genetic exchange. 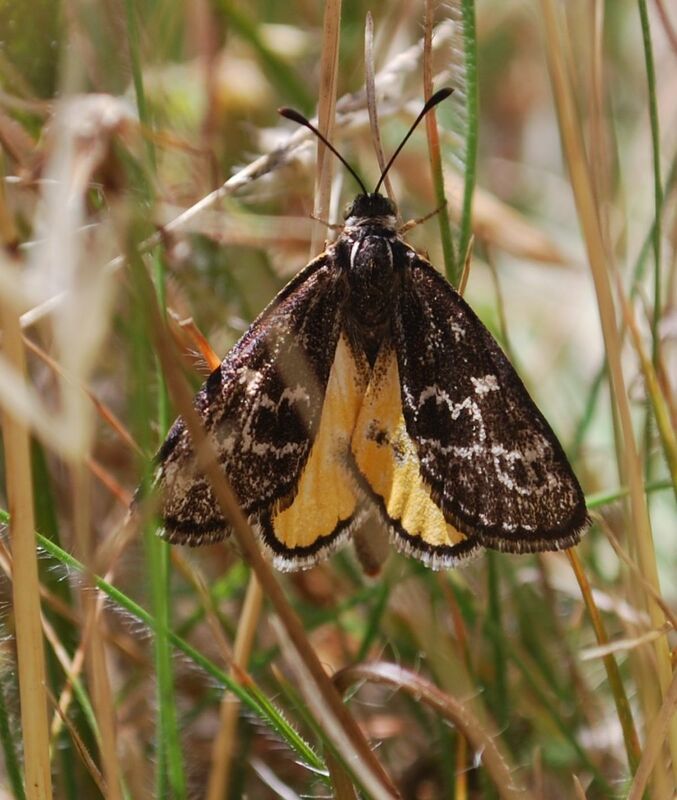 A report undertaken as part of the Victorian Volcanic Plain bioregion Melbourne Strategic Assessment considers 75 % of ‘confirmed habitat’ for the Golden Sun Moth across the Victorian Volcanic Plain is ‘protected’ (DEPI 2013). Golden Sun Moth (male). Image: Elaine Bayes. Following is a snapshot of conservation activities since 2005. Please contact SWIFFT if you have additional information to contribute. A study of food plants including monitoring of Austrodanthonia growth was undertaken at Salibury and Hamilton Copmmunity Parklands and continued annually. Surveys at the Craigieburn Grasslands Flora and Fauna Reserve between 1 November 2005 - 15 January 2006 by L. Gibson observed 1248 individuals during spot surveys. DSE prepared a draft management plan for the Golden Sun Moth and Eltham Copper Butterfly at Salisbury Bushland Reserve in the Wimmera. In 2009 a study into the ecological effects of grazing, fire, mowing and gap dynamics was carried out to understand habitat management. A biomass control was trialled at Taggerty using various methods including grazing, slashing and burning. In 2009 Golden Sun Moth larval monitoring was carried out at Altona as part of a PhD research into larval diet preference investigation by A. Richter, Canberra University. Golden Sun Moth (female). Image: Elaine Bayes. A total of 166 sites were surveyed across the Victorian Volcanic Plains, between Donnybrook in the east and Hamilton in the west. Survey sites represented a variety of land tenures, although most surveys were undertaken along roadsides (52%) and public land (27%), reflecting the difficulty in obtaining contact information for private landholders. Surveys were carried out on sites supporting grassy vegetation irrespective of whether the vegetation was native or exotic and irrespective of past or current land management practices, except for areas that are currently crops. The GSM was observed at 26 sites, mostly around Hamilton where survey effort was greatest. A total of 191 Golden Sun Moths was observed during the surveys, of which 177 were males and 14 were females. Males are most often seen because they fly over the grasslands in search of the females, which rarely fly. Sites with GSM were generally along roadsides and on public land, commensurate with the larger number of sites surveyed in these land tenures. A significant site was discovered at the Parklands Golf Club, Hamilton. The survey found there is a positive relationship between the cover of Austrodanthonia and the number of GSM sighted (Brown and Tolsma 2010). A team from the Arthur Rylah Institute conducted a total of 141 surveys across the Victorian Volcanic Plains. Survey sites represented a variety of land tenures, although most surveys were undertaken on public land (52%), reflecting the difficulty in obtaining access from private landholders. Surveys were carried out on sites supporting grassy vegetation irrespective of whether the vegetation was native or exotic and irrespective of past or current land management practices, except for areas that are currently crops. The GSM was observed at 20 sites (14% of the 141 surveys completed), with 8 of these being private property. A total of 65 individuals (55 males, 10 females) were recorded. More males than females were recorded because the females are generally flightless and remain relatively stationary on the ground. The GSM was recorded as far north as Creswick, near Meredith in the east, and around Hamilton in the west. (Brown, Tolsma and McNabb 2011). 2010, VNPA Grasslands and Golden Sun Moth Community Monitoring Project at native grassland in the western Melbourne region. Monitoring - existing and potential new GSM sites established under VNPA Nature Watch project. Golden Sun Moths were monitored at a site in Nhill over the 2010 summer with over 100 individuals recorded during peak flight period. Habitat restoration at Salisbury Bushland Reserve has successfully involved planting of 6000 wallaby grass Austrodanthonia spp. seedlings into an area previously dominated by wild oats. Further plantings undertaken in 2011. An area of remnant grassland on private property south west of Nhill was fenced off and the grassland restored. The landholder is supporting habitat restoration of native grasses where 10,000 wallaby grass seedlings will be planted which will virtually double the amount of available habitat at the site. 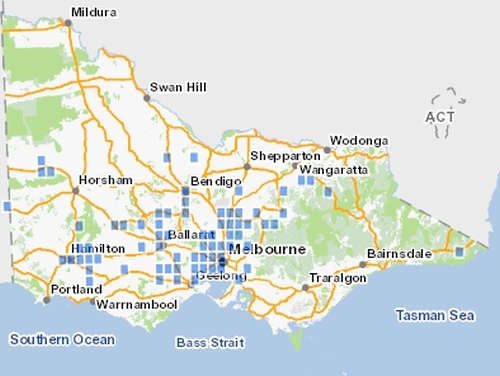 The type of Golden Sun Moth surveys conducted across the Victorian Volcanic Plains in 2009/2010 and 2010/2011 were not undertaken over the 2011/ 2012 summer but regular monitoring was carried out at selected sites. The first sightings at Nhill were on 29 October 2011 with the highest number of 278 individuals in a mass emergence on 4th November 2011. This site has been actively managed to promote native grasses. On-ground works to rehabilitate Golden Sun Moth habitat on private property in the Wimmera undertaken while preparation for translocations of moths to new sites continued in 2011/12. It is expected that the translocation strategy will result in the creation of new Golden Sun Moth colonies within the Wimmera, which in the long term will contribute to the species continual survival in the region. During December 2011 to early January 2012 up to 50 Golden Sun Moths were seen flying at the Hamilton Parklands Golf Course. Report via Liz Fenton, Hamilton FNC. At the Salisbury Bushland Reserve near Nhill, up to 80% of the Wallaby Grass seedlings planted in 2010/11 survived. 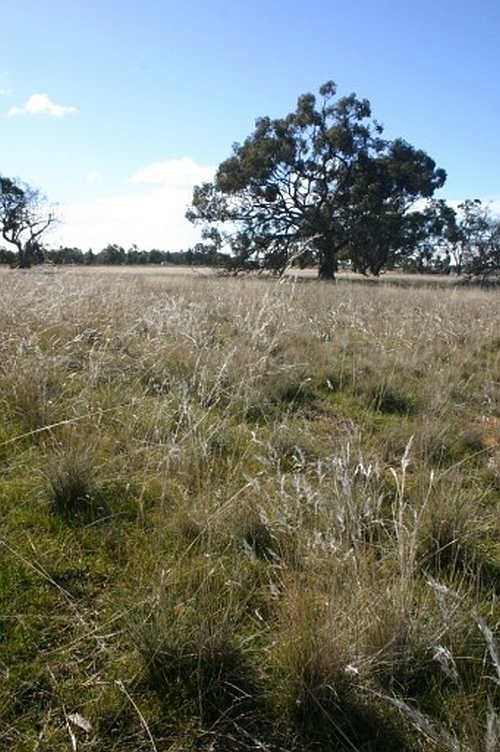 Burning grassland areas dominated Wild Oats and subsequent planting with Wallaby Grasses has been a successful strategy to enhance Golden Sun Moth habitat. On 4 November 2011, 303 individuals were counted. In North East Victoria surveys were undertaken at 44 locations, conducted by Peter Mitchell (contractor). A population was discovered near Murrindindi in central Victoria in the 2011-12 summer, contact Lance Williams at the DELWP Benalla office on 5761 1611 regarding this finding. Golden Sun Moth (male). Image: Liz Fenton. No Golden Sun Moths were recorded in the Wimmera (Nhill area) during the normal surveys (early October - end November) 2014, possibly due to dry conditions but low numbers were recorded in Nhill area in January 2015 after a rainfall event that revived Wallaby Grass in the area and possibly improved conditions for the Golden Sun Moth. An ecological burn was undertaken at Salisbury Bushland Reserve in May 2015 to reduce the cover of weeds (mainly wheat grass and brome sp.) and to encourage native grass growth with reasonably good results. Monitor population on a minimum of four site visits on suitable days (no wind, warm/hot day, clear skies, late morning to mid afternoon period) at weekly intervals during the main flight period (ie November-January). Use a transect approach at 10m wide intervals up and down (across) the study area - this closeness helps to disturb resting males and make them more observable. Ensure moths are active by first checking that they are active at nearby known sites. Use an experienced entomologist familiar with survey techniques for Golden Sun Moth (males fast, erratic low flying in search of females on the ground displaying golden hindwings to attract passing males). Often need to follow males to where they alight on the ground to locate females but this takes away from survey protocols. It is best to have another observer solely searching for females using this approach and having dedicated observer(s) surveying for flying males as they move along each transect at walking pace. (Note that females are known to fly small distances, but this is unusual as they prefer open areas on the ground to attract males). Brown, G.W. and Tolsma, A.D. (2010) A survey for the Golden Sun Moth Synemon plana on the Victorian Volcanic Plains, 2009. Arthur Rylah Institute for Environmental Research. Department of Sustainability and Environment, Heidelberg, Victoria. See pdf. Brown, G.W., Tolsma, A.D. and McNabb, E.G. (2011) A survey for the Golden Sun Moth Synemon plana on the Victorian Volcanic Plains, 2010-11. Arthur Rylah Institute for Environmental Research. Department of Sustainability and Environment, Heidelberg, Victoria. See pdf. Department of Environment, Australia. Golden Sun Moth - Species profile & threats database.